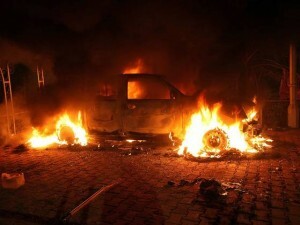 On May 18, 2015, Judicial Watch released a trove of documents acquired from the Department of Defense (DOD)and the Department of State under an FOIA request and subsequent lawsuit revealing that DOD almost immediately reported that the attack on the U.S. Consulate in Benghazi was committed by the al Qaeda and Muslim Brotherhood-linked “Brigades of the Captive Omar Abdul Rahman” (BCOAR), and had been planned at least 10 days in advance. Rahman is known as the Blind Sheikh, and is serving life in prison for his involvement in the 1993 World Trade Center bombing and other terrorist acts. The new documents also provide the first official confirmation that shows the U.S. government was aware of arms shipments from Benghazi to Syria. The documents also include an August 2012 analysis warning of the rise of ISIS and the predicted failure of the Obama policy of regime change in Syria.